Beighton is a small parish to the west of Great Yarmouth, situated north of Cantley and south of Acle. Its name comes from the Old English for the farmstead of a person called Beage/a. Today, Beighton incorporates the old parish of Moulton St Mary, and both parishes are mentioned in the Domesday Book of 1086. The earliest evidence of human activity in Beighton to appear in the archaeological record comes in the form of prehistoric flint tools. Few of these have been found, but what there are have been identified as scrapers, flakes (NHER 42649 and 39397) and borers (NHER 37673). The only datable flint is a Neolithic flake (NHER 40021). Until the development of aerial photography, the only evidence of settlement in the Bronze Age was a socketed axe head (NHER 35212). However, aerial photographs have shown cropmarks of at least seven ring ditches in the parish (including NHER 6097). These are possibly the sites of Bronze Age burial mounds that have been ploughed flat. Caution must be exercised in the interpretation of these marks, though, as a further eight supposed ring ditches in the parish turned out to be undated backfilled pits. Evidence of human activity in the Iron Age is sparse, and at the moment consists only of coins (e.g. 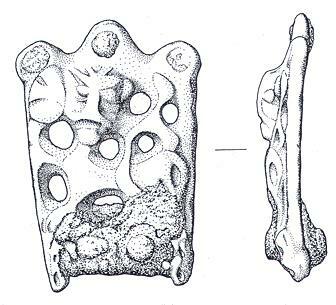 NHER 24805) and pottery fragments (e.g. NHER 39397). However, work in 2006/7 by the Norfolk National Mapping Programme (Broads Zone) identified a number of small sub-rectangular and trapezoidal enclosures and boundaries (NHER 49615, 49645) that clearly pre-dated the Late Iron Age or Roman field system (see below). The Roman occupation is marked by finds of coins (NHER 28691 and 37673), pottery (NHER 37006 and 16304), a brooch (NHER 40021) and a furniture fitting (NHER 37673). Aerial photography has also identified an extensive probable Late Iron Age or Roman field system (NHER 6096) and a possible Roman villa or temple complex (NHER 21762). Some re-used Roman stone has been found in All Saints’ church (see below). The period between the departure of the Romans and the Norman invasion is notable in Beighton for its lack of evidence of human activity. Only a Late Saxon stirrup strap mount (NHER 35212) has been found so far. After the Norman Conquest, buildings that survive today began to appear. All Saints’ church (NHER 10286), although much altered in the 19th century, is mainly 14th century, and has a 13th century font. Some re-used Roman stone has been reported in the nave. St Mary’s church, Moulton (NHER 10393), which has a round west tower, and is 13th century, with a 15th century south porch. Inside is a 13th century marble font and 14th century wall paintings. The church became redundant in the 1960s and is now leased to the Redundant Churches Trust. No medieval residential buildings now remain in the parish, but the moats of Moulton Old Hall (NHER 10394) and Moulton Hall (NHER 10388) have survived, though the houses have gone. Metal detecting in the parish has recovered a range of medieval and post medieval objects, including coins, buckles, lead seals, and horse harness fittings (e.g. NHER 35212, 10268 and 24163). Turning to post medieval buildings, the barn at Hall’s Farm (NHER 22026) is probably the oldest, dating from the 17th century. The barn is, timber framed with a thatched roof. The manor house (NHER 22025) is 18th century, and although it has later alterations, retains much of the original woodwork. The last building to appear in the archaeological record is a World War Two pillbox (NHER 32578). The patchiness of the early record does not necessarily mean that there was no occupation at those times, and may merely reflect a lack of detailed investigation. For example, metal detecting and fieldwalking finds are relatively scarce in comparison with some other parishes. Piet Aldridge (NLA), 24 August 2005.